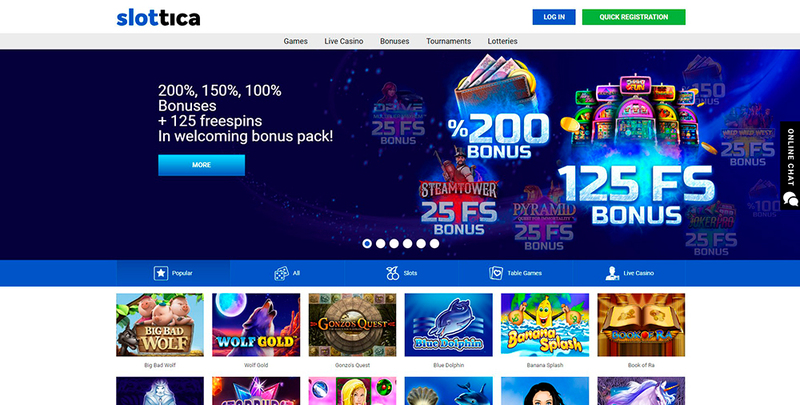 Nowadays, there are many various gambling platforms on the web, but none of them offers such generous bonuses for its clients and such quality games as Slottica Casino. This club has a good reputation due to beneficial conditions for players, high-end customer support service, and wide accessibility for customers from multiple countries. Its reliability is guaranteed by Curacao license that ensures the safety of any financial operations and provides secure storage of personal data of the clients.The website has laconic design and available in three languages. There is no room for boredom in Slottica Casino because its collection of amusements includes hundreds of popular video slots and multiple tables games including different types of roulette, poker, and blackjack. Every game is provided by the leading companies in the industry that work hard to make their products qualitative and interesting for customers from all around the world. In order to become a client of this great online establishment, a user is required to register an account on its website. You can do this by email and password or via social networks. The next step is filling the personal and contact information in the profile. Finally, you should verify your phone number and email to get access to all the services of the club. This will allow you to make deposits, activate rewards, and participate in various activities. Every new player gets a free bonus for registration which is 40 FS on the Wild Wild West: The Great Train Heist with a 70x wager. With these spins, you can make bets up to €/$0,15 until you win back the wager. As soon as you fulfil this condition, the max bet increases to €/$2, and you will be able to withdraw up to €/$8. 200% for a deposit of 100 TL. Moreover, you can receive 500 TL for bets in slots and 500 TL for bets in table games by betting 5 000 TL in each kind of games. All registered users also can activate reload-bonuses for replenishments of certain amounts. You will receive 10% to a 500 TL replenishment on Wednesday, 50% to 100 TL on Thursday, up to 1 500 TL for deposits from 400 TL on Friday, and up to 600 TL for deposits from 100 TL on Saturday and Sunday. Apart from a huge assortment of video slots, there are many live games, such as poker, roulette, and blackjack. Human dealers create an atmosphere of a real casino with all its splendor and festive context. The list of software providers include such great developers as NetEnt, Novomatic, Microgaming, BetSoft, Evolution Gaming, Tomhorn, Endorphina, Booongo, Ezugi, Playson, and many others. All these companies earned their high reputation because of the outstanding quality of their products, so you can be 100%-sure that playing their games will give you only pleasurable experience. Slottica online casino has a professional support team which is available 24/7 via online chat. However, players can get in touch with it by phone or email as well. There are several ways to fill your account with money or receive a payment. For these purposes, clients can use MasterCard and Visa bank cards and different e-wallets, such as Jeton, ecoPayz, Neteller, and Skrill. The minimum deposit is 5 USD, and the maximum payout is 10 000 USD. In order to get your win, you must address the customer support service. After signing up for an account and while using services of Slottica casino you can be sure that your name, phone, email and other personal data will be kept in strict confidentiality and will not be transferred to the third parties. All information provided will only be used inside the company in order to secure your account or in case if the information is required by government authorities. Communications security with the clients of Slottica casino is provided by cryptographic protocol TSL 1.2. The online establishment is licensed by the government of Curaçao. As you can see, Slottica online casino is great by all parameters. You can easily register on Slottica’s website and start gambling in a few minutes, since the sign-up procedure is very simple. Go ahead and give it a try right away, and you’ll never regret this decision! Register and receive no deposit bonus - 40 free spins at the game: Wild West slot. You can get 150% up to €200 bonus for your second deposit. Minimum deposit is €40. The wager is x45. 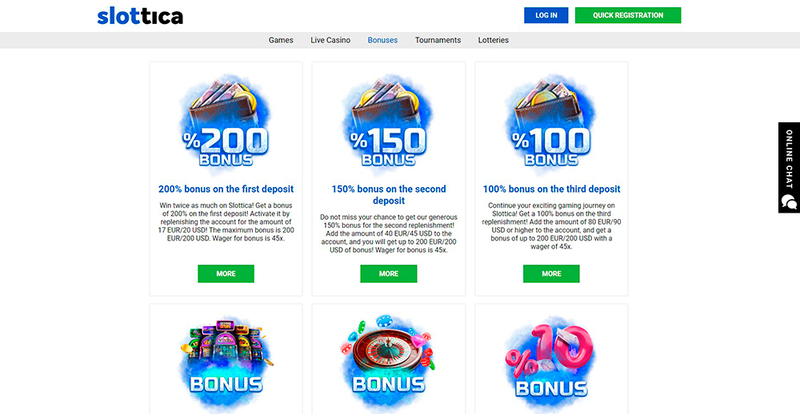 Make third deposit and get 100% up to €200 bonus. Minimum deposit is €80. The wager is x45. Slottica Casino offers a reload Bonus on Wednesdays of 10% up to €200. Min deposit is €85. Slottica Casino offers a reload Bonus on Thursday of 50% up to €200. Min deposit is €18. Every Friday make a deposit of €170 and receive a gift of up to €250. Wager x1. Read more on the casino site. Every Sunday make a deposit of €170 and receive a gift of up to €200. Wager x1. Read more on the casino site.